Christmas is almost upon us, and many are still looking for the perfect present. Do not stress yourself any more than you already are, do not rush across all the Christmas markets right before Christmas Eve to find the perfect present. Decide today and enjoy the time leading up to Christmas. Coupons are a popular present, especially if that coupon can have a lasting positive effect on someone’s energy and overall joie de vivre. 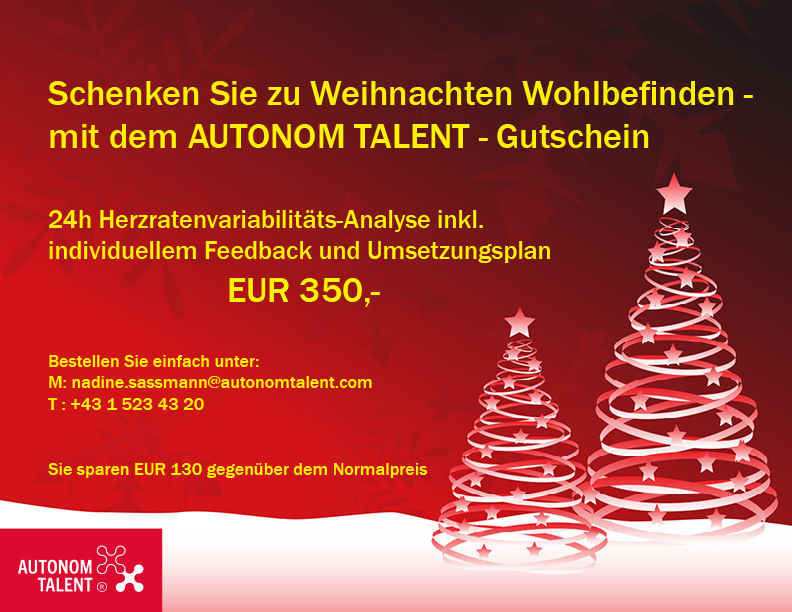 Give our AUTONOM TALENT®-Programme as a present to your family, your friends, your co-workers or your head of executives this year. This ensures the possibility for an objective determination of where you are in life as well as a lasting guarantee of your personal, physical and mental ability to recover and perform. Rapid recognition of stress-inducing situations and a more self-aware way to deal with stress. Optimal use of individual resources and potential to perform.